The 2015 National Association of REALTORS® Legislative Meetings took place in Washington, D.C. last week. Members and staff from the Cincinnati Area Board of REALTORS® met with our area U.S. House Representatives and both Ohio Senators Sherrod Brown and Rob Portman. 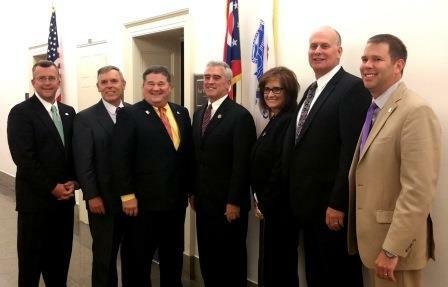 Pictured here after meeting with Congressman Brad Wenstrup are Mark Quarry, Director of Government Affairs, Jim Abele, Chief Executive Officer, Joe Mock, 2015 CABR President, Patti Stehlin, 2015 CABR President-Elect, Mark Stehlin and Pete Kopf, 2015 OAR Treasurer and former CABR President. Click here for a video describing the 2015 NAR Legislative Meetings. Click here to read more about everything that took place last week in NAR’s Legislative Live BLOG.